$55.785 million on 3575 screens. According to common thinking, when leading ladies reach “a certain age”, they lose box office luster and get pigeonholed into a limited set of roles. Whereas these actresses once played romantic interests, as they age they find themselves left with supporting parts as mothers and similar characters. Don’t tell Sandra Bullock, as she seems determined to break that trend. Yeah, she looked headed down that path a few years ago, as she earned an Oscar for her work as a supportive mother in The Blind Side, but 2013 shows that Sandy probably won’t get stuck with middle-aged mom parts any time soon. Indeed, 2013 may go down as Bullock’s best year ever, at least in terms of box office. At the age of 49, first she played an FBI agent in the rollicking, profane hit comedy The Heat, and then she managed to take the lead as a potentially doomed astronaut in Gravity. The Heat took in $229 million around the globe, which seems like a fine total – until you look at what Gravity did. It topped out around $700 million worldwide and snared 10 Oscar nominations – not bad for a sci-fi action flick, right? During a mission to repair the Hubble telescope, a team of astronauts endures a major crisis. When the Russians use a missile to destroy a defunct satellite, all hell breaks loose, as the debris flies through space and takes down everything it encounters. That includes the space shuttle and related elements. 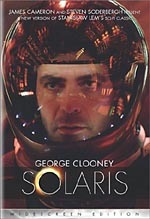 Astronaut Shariff (Phaldut Sharma) gets killed almost immediately, and specialist Ryan Stone (Bullock) finds herself cut adrift and floating in space. Veteran commander Matt Kowalski (George Clooney) remains cool and saves her, but a variety of challenges await them. We follow their attempts to stay alive and make it to a functioning space station while they continue to evade debris that returns every 90 minutes. Going into Gravity, I feared it’d be one of those movies that tells you everything in its trailer. After all, it didn’t seem like a film that would come heavy on plot. As I went into the story, I worried it’d be 90 minutes of Bullock as she floated through space and cried for help. Which is kinda sorta what happens, actually, though the movie manages more depth and breadth than that. Included along the way, you’ll get a minor treatise on faith and perseverance. But those don’t become a substantial element here, as they remain subtext more than anything else. Instead, Gravity turns into a basic survival tale, one that gains power from its unusual setting. Granted, it does come with a bit of an Apollo 13 motif, but it manages a different feel, so it doesn’t come across like a rip-off of that classic. Probably the biggest change comes from the claustrophobic focus of Gravity. While Apollo mixed shots of the astronauts with scenes at NASA and with family members, Gravity never leaves space. We only see the (living) faces of Stone and Kowalski – we glimpse Shariff after he dies – and the film never leaves their perspectives. While we hear from mission control in Houston, the story doesn’t take us there, so we’re forced into the POVs of the astronauts – which means primarily Stone, as the tale concentrates on her side of matters. That’s a smart move, as it allows the movie to become more intense. Shots of mission control or others on Earth would give the audience a change to breath; that's not necessarily a bad thing – and it worked for Apollo 13 - but for the tale being told here, the tight focus makes sense. We get enough backstory from the astronauts’ dialogue to flesh out the roles and not make us feel we miss anything due to the tight focus. Given the spareness of the plot, it becomes important that we bond with the leads, and we do. Stone can seem a little annoying at times, though I find it hard to call this unrealistic; a newcomer to space, it makes sense that she’d be as freaked out as she is. Bullock manages to play her in a natural manner that feels believable, and Clooney adds the right kind of charm and “can-do spirit” to his part. Gravity bathes all of this in spectacular visual effects. Unlike Apollo 13 - with its ample Earth-bound footage – almost everything we see here takes place in space, which means the filmmakers needed to create it all in a studio. The various production teams do this in terrific fashion, as they create the genuine illusion that we find our characters in the Earth’s orbit. That said, I wouldn’t call Gravity an “effects movie”. It uses the visuals to immerse us in the situations, so the effects add to our engagement. All of this adds up to a fine film. I admit I don’t love Gravity as much as some, mainly because the spare nature of the narrative can be an issue for me. Nonetheless, it’s a minor concern, as the action and drama found here make the end result a winner. Gravity appears in an aspect ratio of approximately 2.40:1 on this Blu-Ray Disc. The movie offered a terrific transfer. Sharpness seemed solid. At all times, the film seemed accurate and concise, with nary a sign of softness on the horizon. I saw no signs of jaggies or moiré effects, and the image lacked both edge haloes and source flaws. With its orbital setting, the palette tended toward a bluish feel. This made sense and still allowed for other hues, mainly yellows influenced by the sun. The colors seemed accurate and well-rendered. Blacks appeared deep and dark, and shadows – which became a significant factor here – looked smooth and concise. I felt pleased with this transfer. This “Diamond Luxe Edition” Blu-ray lets you hear the film with a Dolby Atmos soundtrack – if you own the equipment to play it. The track works on standard Blu-ray players but requires an Atmos-equipped receiver – as well as more speakers – to get the full effect. Maybe someday I’ll upgrade for Atmos, but that day isn’t today. Happily, the Atmos mix played back as Dolby TrueHD 7.1 for those of us with “antiquated” systems and it added strong involvement to the experience. From start to finish, the movie used all the channels in an engrossing manner, as elements cropped up from around the room on a virtually constant basis. This meant all forms of auditory material. Music was an active participant, and the mix placed dialogue in the side and rear speakers frequently. Effects added pep when appropriate – most notably in the action scenes – and placed us in the environments well, though in an unusual way. The film adhered to the silence of space, so effects came from the POVs of the characters and the occasional interior scenes. These methods created a good take on the auditory opportunities. Audio quality pleased. Speech was concise and distinctive, while music showed nice range and punch. Effects brought out clear, accurate elements as well, with nice low-end when appropriate. The soundtrack accentuated the film in a fine way. How does the 2015 “Diamond Luxe Edition” of Gravity compare to the original Blu-ray? Audio offers an upgrade if you have the requisite equipment. Viewers with Dolby Atmos or 7.1 systems will find a boost, but those with 5.1 set-ups won’t find any auditory improvements. To my surprise, I think the “Diamond Luxe” Blu-ray delivers a minor upgrade in terms of visuals. The original disc looked very good, but the “Diamond Luxe” version seems just a smidgen better-defined. That leads me to an “A-“ for the “Diamond Luxe” transfer vs. a “B+” for its predecessor; it’s not a big enough step up to merit a repurchase, but it does seem more precise. The “Diamond Luxe Edition” offers the same extras as the original Blu-ray and some new ones. These open with a nine-part documentary called Mission Control. All together, this package runs a total of one hour, 46 minutes, and 36 seconds. During the nine parts of “Mission Control”, we get comments from writer/director/producer Alfonso Cuaron, writer Jonas Cuaron, producer David Heyman, visual effects supervisor Tim Webber, visual effects producers Charles Howell and Richard Graham, executive producer Nikki Penny, compositing supervisor Anthony Smith, animation supervisor Max Solomon, CG lighting supervisor Paul Beilby, motion control robots operator Jeff Linnell, CG sequence supervisor Stuart Penn, additional compositing supervisor Kyle McCulloch, movement coach Francesca Jaynes, special effects supervisor Manex Efrem, physical trainer Simone Ayesa, stunt coordinator Franklin Henson, movement artists Avye Leventis, Mikey Brett and Robin Guiver, special effects floor supervisor Alan Young, production designer Andy Nicholson, supervising art director Mark Scruton, CG modelling supervisor Ben Lambert, HOD modeller Pierre Bohanna, costume designer Jany Temime, editor Mark Sanger, CG supervisor Chris Lawrence, supervising sound editor/sound designer Glenn Freemantle, re-recording mixer/sound design editor Niv Adiri, supervising dialogue/ADR editor Nina Hartstone, composer Steven Price, musician Alasdair Malloy, and actors George Clooney and Sandra Bullock. “Control” looks at script/story/character areas, cinematography and the depiction of space sequences, various effects and filming “zero G” shots, cast, training and performances, sets, costumes and visual design, editing, audio, music, and other elements. Initially I felt disappointed that the disc lacked an audio commentary, but given the length and complexity of “Control”, that feeling quickly faded. Indeed, due to the film’s intense focus on visual elements, this super-long documentary probably acts as a better complement since it shows us the techniques as we hear from participants. “Control” covers the film in a thorough and satisfying manner. Five Shot Breakdowns cover a total of 36 minutes, 48 seconds. In these, we hear from Alfonso Cuaron, Tim Webber, Paul Beilby, Max Solomon, Niv Adiri, Glenn Freemantle, Steven Price, Manex Efrem, Franklin Henson, Chris Lawrence, Anthony Smith, David Heyman, Francesca Jaynes, Sandra Bullock, Pierre Bohanna, Andy Nicholson, Jonas Cuaron, additional unit lighting supervisor Ashley Palin, CG effects supervisor Alexis Wajsbrot, visual effects creators Ian Cope and Tony Clark. These examine elements related to astronauts’ visors, the fire in the space station, Dr. Stone’s “rebirth”, sound design in space, and splashdown. This means the featurettes show the various components that came together to create the complicated sequences. The “Breakdowns” area feels like an extension of the “Mission Control” compilation. Created by the same production company, the featurettes progress in the same manner and come with the same vibe. I regard that as a good thing; since “Control” works so well, I’m happy to find more of the same here. The “Breakdowns” offer a lot more useful information. A documentary entitled Collision Point: The Race to Clean Up Space goes for 22 minutes, 28 seconds. Narrated by Ed Harris, the piece includes notes from Alfonso Cuaron, former NASA Senior Scientist for Orbital Debris Research Don Kessler, Center for Orbital/Reentry Debris Studies principal engineer, Dr. William Ailor, Packing for Mars author Mary Roach, retired NASA astronaut Dr. Dan T. Barry, Aerospace Corporation Senior Engineering Specialist Dr. Roger C. Thompson, Integrity Applications Incorporated technical director Darren McKnight, Aerospace Corporation Associate Principal Director Ted Muelhaupt, and University of Southampton senior aerospace engineer and lecturer Dr. Hugh Lewis. The program examines issues related to debris that orbits space. Obviously this subject connects to Gravity in a close manner; indeed, the show uses ample footage from the film. It becomes a pretty compelling look at the problem and possible solutions. Next we get a short film called Aningaaq. Directed by Alfonso’s brother Jonas, it lasts six minutes, 53 seconds and shows the tale of a character who remains off-screen during Gravity. It’s interesting to see, but I prefer leaving the earth-bound character’s actions to the imagination. We can watch Aningaaq with or without a three-minute, 18-second introduction from Alfonso and Jonas Cuaron. They give us set-up for the short and their inspiration for it. The intro allows us to get a good perspective for the film. The rest of the disc’s extras come exclusive to the “Diamond Luxe” release. Looking to the Stars: The Evolution of Space Films runs 41 minutes, 58 seconds and offers thoughts from Alfonso Cuaron, Heyman, USC Professor Nicholas J. Cull, visual effects supervisors Karen E. Goulekas and Dennis Muren, visual effects designer John Dykstra, special effects supervisor Neal Corbould, cinematographer Michael Seresin, author Gary Westfall and filmmakers Ron Howard, Joe Dante, and Douglas Trumbull. “Evolution” starts with Georges Méliès’ 1902 classic A Trip to the Moon and progresses through 1929’s Frau im Mond, 1950’s Destination Moon, 1957’s Road to the Stars, and 1969’s Marooned. 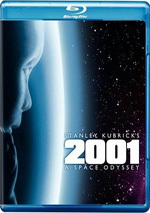 The show also covers 1968’s 2001: A Space Odyssey, 1977’s Star Wars, 1983’s The Right Stuff, 1995’s Apollo 13 and Gravity. Unsurprisingly, “Evolution” tells us more about Gravity than any of the others, but it still offers a pretty interesting overview. I especially like the parts about the less famous flicks like Mond and Road; film fans already know a lot about movies like Star Wars and 2001, so it’s good to get a broader perspective. For an alternate soundtrack, Gravity comes with an option called Silent Space. After a 44-second intro from Alfonso Cuaron, this gives us a Dolby Digital 5.1 mix that omits the film’s score. Mostly, that is. A few scenes – like one in which the astronauts discover a corpse – use effects in a manner that resembles music, but the vast majority of the movie plays with “standard effects” only. That makes it an unusual – and interesting – way to watch Gravity. Does it work better? No – while the score-free version seems more realistic, it also feels less intense. Still, I like the option and think fans will enjoy the ability to get a different take on the tale. Gravity: The Human Experience lasts 11 minutes, five seconds and delivers info from Alfonso Cuaron, Clooney, Heyman, Roach, Barry, Bullock, Jonas Cuaron, and astronauts Michael J. Massimino, Jean-Francois Clervoy and Catherine Coleman. This piece discusses aspects of space travel and their reflection in Gravity. A few decent moments emerge here but the program lacks a whole lot of meat. Finally, we find Sandra’s Birthday Wish. In this three-minute, 21-second clip, we get a silly little video Bullock made as a birthday greeting for Alfonso Cuaron. It’s goofy fun. 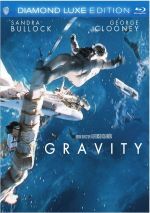 One of 2013’s big critical and commercial hits, Gravity provides an unusual take on a “castaway” story. It mixes a tight narrative with strong acting and excellent visual effects. 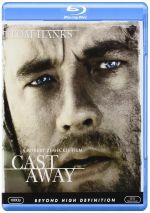 The Blu-ray excellent picture and audio as well as a strong set of supplements. This “Diamond Luxe Edition” of Gravity differs from the original Blu-ray in three ways. It replaces the prior disc’s DTS-HD MA 5.1 soundtrack with Dolby Atmos audio; that version “downmixes” to Dolby TrueHD 7.1 for folks without Atmos capabilities. In addition, the “Diamond Luxe Edition” adds a few new supplements but it loses the 3D presentation of the film. If you already own the 2014 Blu-ray and don’t have Atmos capabilities, there’s little reason to buy the ”Diamond Luxe”; the new extras are decent but not enough to merit a purchase on their own. If you do own an Atmos-equipped system, the “Diamond Luxe” Blu-ray becomes more appealing, though the choice will depend on whether you also can watch Gravity 3D – and whether you find 3D more important than Atmos. In a perfect world, the Atmos Gravity would also be 3D, but we don’t get that here. Since I own a 3D TV but don’t have an Atmos set-up, I’ll stick with the original Blu-ray for future viewings.